Prior to joining Roberts in 2012, Donna McLaren was Director for Branding and Advertising for Kodak’s commercial printing business. In that role, she managed a worldwide team in the development and execution of B2B marketing communications. She has more than 20 years working in marketing, product launch, and training in corporate America. 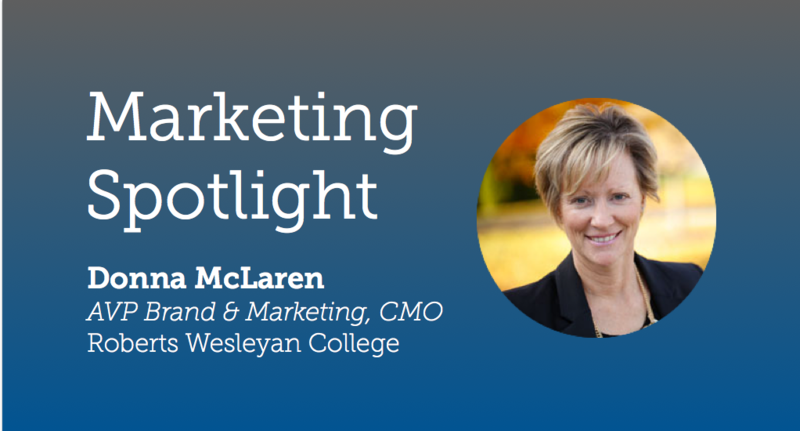 She has been and adjunct professor at the College since 2006 and has taught in both the Masters of Strategic Marketing and Leadership graduate programs. She also teaches Advertising and Consumer Behavior to undergraduates. When I was at Xerox, after being in training for about four years, I applied for a Marketing Program Manager position supporting 500+ dealers. I got the job! I learned how to launch products and how to work with and engage the sales team. I loved it! I relished in seeing sales results that beat our goals – I was hooked! Who or what were your biggest influences? Was there a defining moment when you picked this career? In 2012 Kodak was going through another restructure and I was event going to look for a job when someone came up to me and asked if I saw the job at Roberts Wesleyan College. I took a leap of faith and was ready to see where this new opportunity would take me. I also knew as a mom that I could never get the time back, and I admit that I worked a lot when my daughter was younger, so I decided to be just two minutes from my daughter’s school as she finished her high school education. And now, I never miss any athletic or music event. Our challenge is doing more with less. This isn’t unique, but we have decided to do less marketing more effectively. Doing a lot of things and not being focused won’t yield results – it may lead to mismanaged resources and the stress of not feeling like we are making a difference. So, focusing on the main priorities and doing them with excellence will be our focus. We are working on another re-launch of our web experience. To us it is about design, but also about the experience we are providing. The user experience should include what visitors want like fast load times, app-like navigation and highly visual content. We need to better respond to our prospects. We will do that by knowing how they consume data and what the top content is that they are looking for. Facebook, Twitter, Instagram, YouTube, Snap Chat, Pinterest and LinkedIn. When I started in this role, I hired a manager for social media and the web (as there wasn’t a person who was dedicated). We had to build the social media audiences from the ground up as they were tactical (Facebook and Twitter for Admissions) and not a strategic social media experience. We also implemented integrated marketing plans for digital advertising, SEO, AdWords and email marketing. This has enabled efficient and cohesive campaigns versus adhoc media placements that couldn’t be measured. Which specific channels have been most effective for your business and why? All website decisions are based off Google analytics. We used this data when we transitioned to a responsive design. The top user actions became the top priorities. We use HubSpot for digital campaigns, social media scheduling, landing pages, SEO and email. We use Google Analytics for website and advertising tracking. What is the biggest benefit of partnering/working with an agency? How do you form great partnerships with your agencies? They are experts in what they do, they focus on growth for their clients and they’re fun! Agencies are paid to come up with new ideas for achieving success and in-turn they earn the trust of their clients. Once a client gets a “big win” the agency becomes a trusted partner. And you are proud of the results because you hired the agency! An agency helps to create really impressive work that is done in collaboration – such as advertising campaigns, marketing collateral, magazine design and layouts, public relations stories and crisis communications. Working with an agency creates an extension of your team. They focus on making their client shine – and that is the way it should be. Being cool and caring is something we learned. When we initially launched Snap Chat our staff ran it and it flopped. Once we hired a student to run it, our audience doubled within a few months! It was clear to us that we needed to use “student speak” that was authentic. 1. Have a desire to learn. Continuous education is important in the professional world. Learn and translate that into new opportunities. 2. Involve your team vs. doing it yourself. People, who feel included in a project, can enable innovation. Overall the team effort can improve the quality of ideas produced – it can also produce healthy debate and compels people to think differently. In the end the team can celebrate the success together and learn from what went well and what didn’t. Your brand isn’t what you say it is; it is what your consumers say it is. We conducted brand research for our website and that takeaway really resonated with our team. So, we used that data to help us message to our audiences in a genuine and trusted way. It is important to deliver, the web experience to customers, that they want not what you think it should be. I taught Time Management when I worked for Xerox and I learned that by following productivity principles I waste less time and have more energy to be effective in my work every day. It’s a “use valuable tips and tricks to get the most out of your day” habit. Recommend a book or two!